Is this weekend, 18th and 19th August! 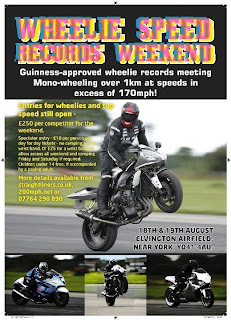 Aside from the top speed guys, who'll be clocking speeds knocking on the door of 250mph, and the mono-wheeling headcases topping 170mph at the end of a one kilomettre wheelie, there'll also be a stunt competition too. So 'action packed' is perhaps an apt phrase. The gates open at 10am on Saturday, and racing will end at about 5pm on Sunday.